Description: A fantastic Samurai tournament fighting game. Featuring some very exciting characters with wicked looking blades. Getting slashed draws blood and the technique of defending and attacking feels very balanced in this game. 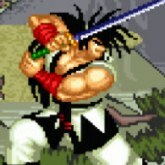 With 15 fighters to choose from and many cool levels to fight at, Samurai Showdown 2 is a very solid classic that provides a lot of technical skill for fans of the fighting genre. Game Controls: Shift Key = In-cert Coin. Enter Key = Start. Arrow Keys = Move. "Z, X, C" Keys = Attack. See In-game Controls for more options, by "clicking" controller in the bottom left corner of the screen.